Essential oils of aromatic and medicinal plants generally have a diverse range of activities because they possess many active constituents that work through a several modes of action. Artemisia, the largest genus of the family Asteraceae, has a number of effects against human and plant diseases. 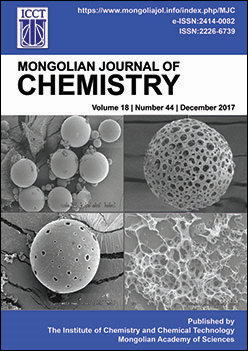 The main purpose of the present study was to investigate chemical compositions of essential oils of two Artemisia species, Artemisia palustris L and Artemisia sericea Weber ex Stechm from the Mongolian steppe zone using gas chromatography and gas chromatography-mass spectrometry. The essential oil of A.palustris was characterized by the presence of monoterpene hydrocarbons such as trans-β-ocimene (59.1%), cis-β-ocimene (11.6%) and myrcene (7.1%), while the oil of A.sericea was dominated by the presence of three oxygenated monoterpenoids as 1,8-cineole (25.8%), borneol (22.5%) and camphor (18.8%) which are used for preparation of a fragrance and medicinal products.